This great horned owl was seen by Marc Meyer near McPhee Reservoir in September. Birding in winter? Many people think of birding in the spring, when migrants from the South come back to our own little corner of paradise. But birding in the winter can be fun and rewarding as well. One easy way to bird is from the comfort of your own home. Winter is a great time to put birdseed in the birdfeeder outside your window, sip a warm cup of coffee and watch to see what comes to visit. Bears are sleeping off the winter in their dens, so their visits aren’t much of a worry, and the birds that do stick around during this cold season will be grateful for the supplemental food source when others are scarce. Suet is important for birds to have access to in winter, as well as throughout the year. Suet is typically made of rendered animal fat, which provides necessary calories and nutrients for birds. In the winter, this is especially necessary as birds use up much of their energy keeping warm. Suet can also come in the form of vegetable fat, and often includes other sources of energy, such as seeds, and even insects and fruit. Some people also enjoy feeding turkeys this time of year, and they typically feed on cracked corn. So, what birds might you encounter this time of year? You might be surprised at the diversity we still have here. Some of the more typical species that stick around this area that you might see at your feeder include: black capped and mountain chickadees, house finches, English (aka house) sparrows, red and white breasted nuthatches, dark-eyed juncos, pine siskins, goldfinches, Eurasian collared doves, golden-crowned kinglets and plain titmice. These smaller birds at your feeders may attract bird-eating hawks such as sharp-shinned and Cooper’s hawks, which may or may not be to your liking, depending on the species being eaten (non-native species such as collared doves or starlings might be more acceptable than goldfinches). Larger birds that are around include ravens, crows, magpies, Clark’s nutcrackers that come down from the mountains, and jays including pinyon jays, scrub jays, gray jays and Stellar’s jays. Woodpeckers are another group of birds easily seen this time of year, including Lewis’, downy, hairy and flickers. Near the river you might find dippers, kingfishers and even bald eagles looking for a fishy meal. Raptors can easily be seen this time of year, including red-tailed, ferruginous and rough-legged hawks, kestrels, northern harriers and golden eagles. 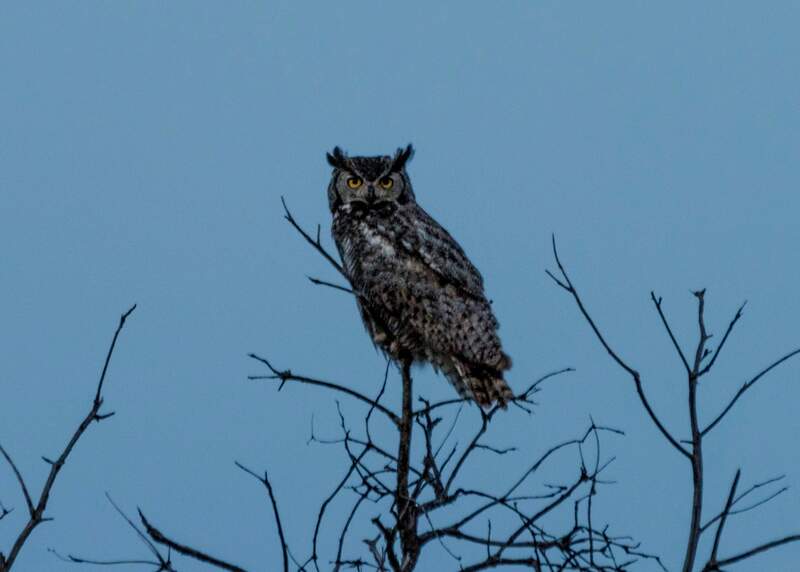 In the evenings, you might hear great horned owls or pygmy owls. With leaves being gone from the trees, not only are birds more easily seen, but nests are as well. Orioles flee to warmer climes in the winter, but it is a wonderful time of year to view their awesome hanging nests, usually found in open woodlands and parks in deciduous trees. You may find robins’ nests, and nests of smaller birds – maybe even hummingbirds – that wouldn’t be as easily seen in the spring or summer. Ducks are fun to look for this time of year as well, especially along rivers or at local lakes before they are frozen over. Buffleheads, mergansers, mallards, pintails and green-winged teals are a few water species that can be found, as well as the ubiquitous Canada geese. Another bird you may see along the edges of rivers is the American dipper – North America’s only aquatic songbird! It can swim, and walk under water, catching the food it eats, which mostly consists of aquatic insects and their larvae, worms, small fish and fish eggs. Project Feeder Watch is a great place to practice your bird-watching skills, as well as participate in a citizen-science program. In this program, people watch their feeders at home, at nature centers, parks and other places throughout the winter, and report their findings to scientists at the Cornell Lab of Ornithology. This helps scientists in keeping track of populations of bird species in your area and all over North America! Find out more at feederwatch.org. To supplement your winter bird-watching enjoyment, San Juan Mountains Association has many bird-related items, and almost everything in our bookstores is on sale – 20 percent off – until Dec. 31. Some items we have include bird-identification books: Birds of Colorado by Stan Tekila, Birds of the Rocky Mountains, Sibley’s Field Guide to Birds of Western North America, The Bird Log for Kids and Hummingbirds. We also have the Audubon plush birds that “sing,” which are fun for kids and adults, and a couple of laminated quick guides to birds as well. To continue your bird-watching enjoyment, you can also put the Ute Mountain Mesa Verde Birding Festival on your calendar for May 10-14. It is a fundraiser for the Cortez Cultural Center. The agenda should be online probably sometime in January, at cortezculturalcenter.org/birding-festival/. Gabi Morey is education outreach director with San Juan Mountains Association, a nonprofit dedicated to public land stewardship and education.